Aether Fest is a month-long celebration of adventurous radio art organized by Nonsequitur and presented in partnership with KUNM-FM and Harwood Art Center. There’s a certain mystique around the overnight shift. Being the lone DJ in an empty station spinning records in the wee hours while most of the world sleeps is a singular radio experience. Every now and then some fellow night owl calls to reassure you that yes, there is someone listening out there. And at 3 AM, “freeform” can take on a whole new meaning. This is when inspired mad professor DJs can get away with almost anything — mixing all the turntables and CD players and cart machines at once, having musicians and poets come jam in the studio, putting random callers on the air…But Aether Fest is about doing radio differently, even the graveyard shift. So instead of providing the usual entertainment for insomniacs, we thought we’d offer something special for our listeners who normally miss the overnight slot. You know, the ones who are asleep. 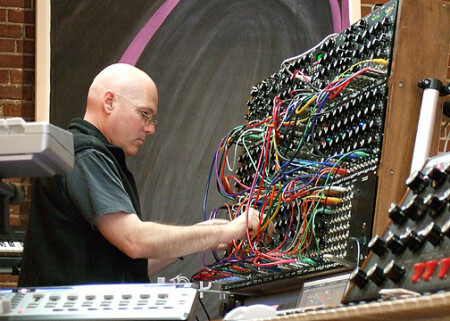 Tonight, acclaimed Bay Area ambient/electronic composer Robert Rich will visit KUNM to perform Somnium, a composition intended for sleeping audience. Rich usually performs this piece as a Sleep Concert, with the audience camped out in the performance space. But since it’s a work night, we thought we’d let you experience it in the comfort of your own cozy bed, without a bunch of strangers snoring all around you. Developed between 1994 and 2000, and recently released as a 7-hour long audio-only DVD, Somnium was created as a soundtrack for your dreams. And dreamy it is. Rich weaves a deep and sonorous blanket of gentle synth drones, murky environmental sounds, and extended instrumental passages charted to correspond with the different levels of sleep most of us pass through in the course the night. So curl up with that bedside radio turned on at a suitably low volume and let yourself drift in and out of this nocturnal sonic environment. Up all night? Tune in anyway, there’s plenty to reward the wide awake listener.